It looks like Motorola is planning to launch a new Android square phone. The top flips out to reveal a full QWERTY keyboard underneath the display. 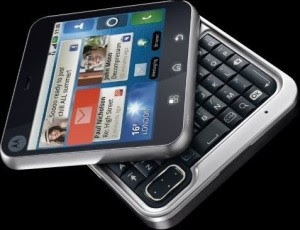 The Motorola Flipout will be a MOTOBLUR handset and will come equipped with version 2.1 of the Android OS. FlipOut has a display size of 320 X 320 px with 2.8 inches, TFT touchscreen, 256K colors.This model comes with Camera of , 3.2 Mega Pixels Camera with , Digital ZoomQWERTY keyboard, 700MHz processor, GPS, WiFi, 512MB ROM and 256MB RAM. It will come in three delightful colors Black, Green, Pink and should be available from June 2010. No news about the price. Stay in touch we will keep you informed. Tags: Motorola FlipOut, Motorola FlipOut review, Motorola FlipOut multimedia features, Motorola FlipOut features, Motorola FlipOut details, Motorola FlipOut specifications, Motorola FlipOut information, Motorola FlipOut images, Motorola FlipOut pics, Motorola FlipOut pictures, Motorola FlipOut hardware features, Motorola FlipOut software features, Motorola FlipOut application features, Motorola FlipOut availability, Motorola FlipOut price.